It has been too long. Life gets away and before you know it months have passed. All is good and everyone is still eating and after 6 hours of soccer and 2 hours of swimming everyday, the kids are hungrier than ever. The adults don’t burn the same amount of calories driving them to sports or working, but we still eat as much as they do. So this time of year is so exciting minus the stiffening heat, humidity and mosquitoes. Twin Springs is starting to get the all the good stuff and we have already passed asparagus season, which is one of my personal favorites. The pain of loosing them is only lessened by the excitement of what is next. English Peas, Snap Peas, tomatoes and the tree fruit is on the way. 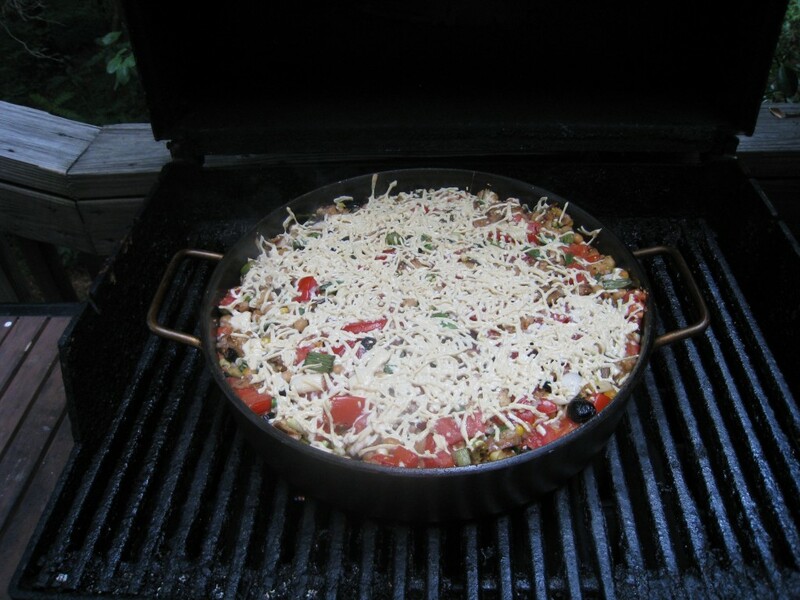 I have a new favorite quick dish that is great when you don’t want to cook inside. The market has had some of the best beets in memory and we are all fans. 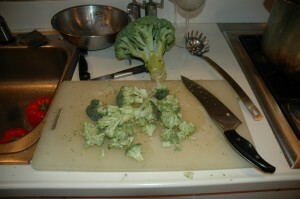 The greens on top are delicious as well, but somehow they got a little too slimy to use by the time I was ready to use. 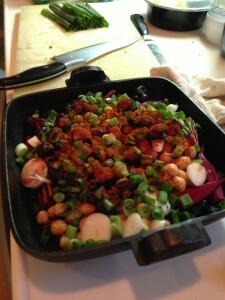 I like to leave as much of the tops on without the greens when I cook this dish. 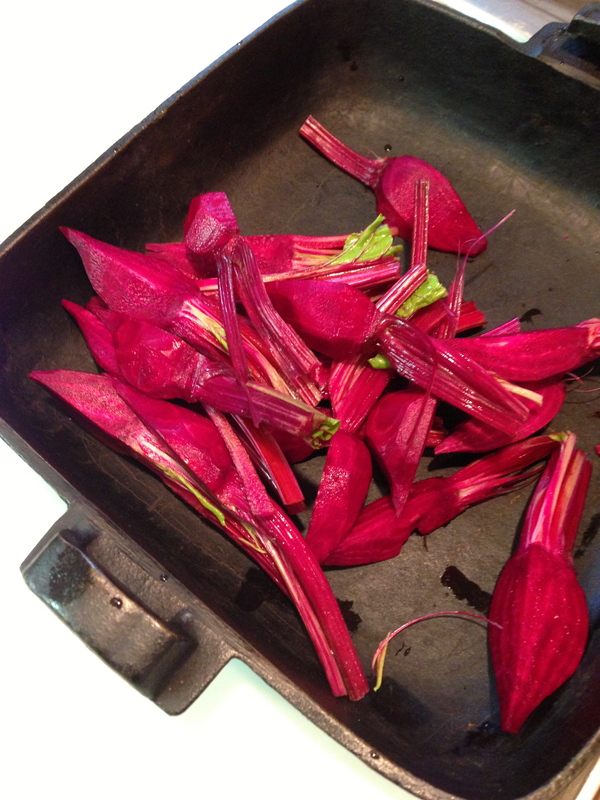 I will cook the beet greens separately when they are good. Cleaning is the hard part since they grow in dirt, but ample rinsing and pealing of the skin with a little knife does the trick. I use my grandmother’s cast iron pan and put in olive oil, beets, fresh spring onions, garlic scapes, Moroccan oil cured olives, Garbanzo beans, paprika, turmeric, fresh thyme, salt and pepper. I don’t even mix it until it cooks a little but I throw it on the grill at the highest temp and walk away to prep the other veggies. It takes about 15 minutes and in that time I clean the last asparagus of the season and dice tomatoes with whatever fresh herbs we have and mix with salt, pepper and olive oil that will accompany a little brown rice pasta. The whole meal took about 20 minutes from beginning to end and with a crisp French Muscadet and air-conditioning, you almost forget the heat of the day. Sorry for the long delay in postings. Couldn’t let the spring go by without making and posting one of our favorite dishes. 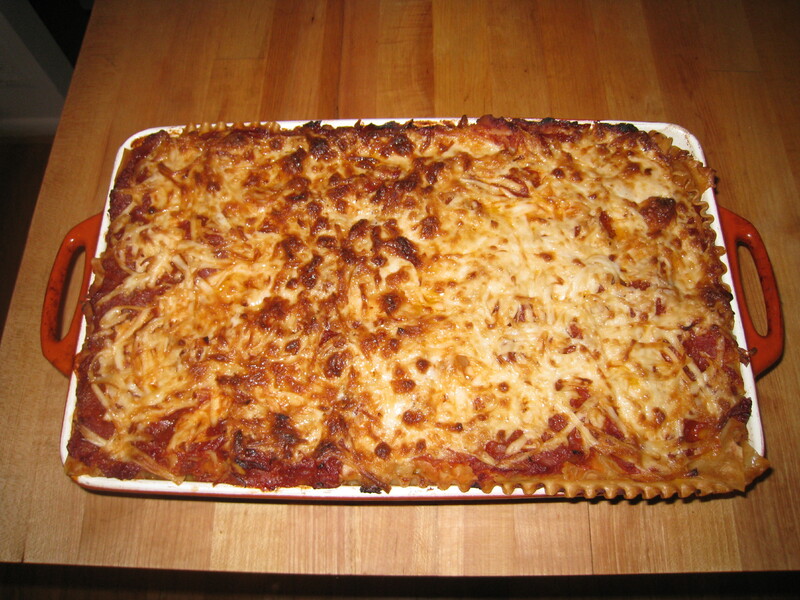 This is Washington and soon it will be so insanely hot and humid that a hot piping lasagna will not hit the spot. While we still have some chilly nights and days, having the oven and burners going for a few hours helps warm the house and heavier than usual dish still sounds fantastic. With skiing over we have a little more time to cook and at least get something in the oven even if we have multiple soccer, swimming and piano events to drive to. Once assembled, it can be left alone in an oven for up to two hours. While we can make our own noodles, I haven’t yet perfected the gluten free lasagna noodle. Working with brown rice flour is very tricky and if I had to roll my own for the lasagna, I don’t think I would make it very much. I never think it will take too long to do everything, but Virginia always tells me I have no concept of time and how long it takes to throw a dish together. 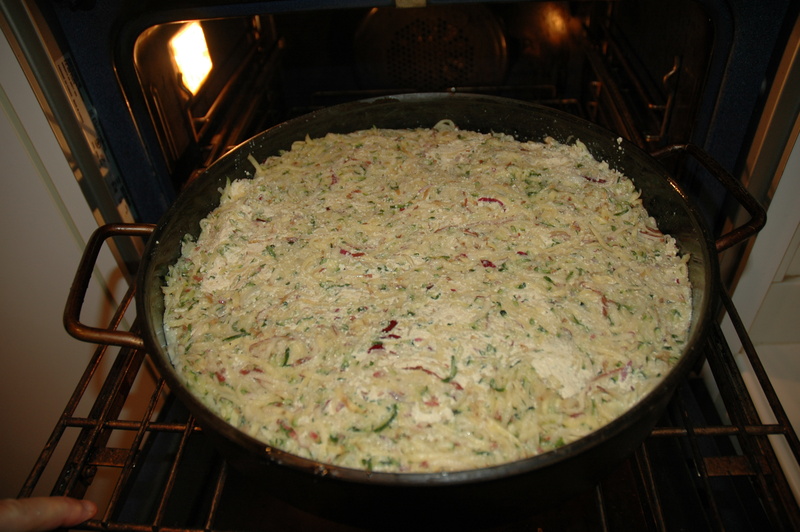 Fortunately, Tinkyada, makes a great organic gluten free brown rice lasagna noodle which allows me to concentrate on the rest of the dish and make it in about 45 minutes of prep time. This can take a lot less time if you have some of the basics pre-made. 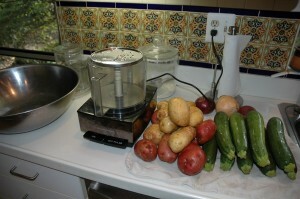 First thing is to get the tomato sauce going, which is easy to do and I have posted about before. Our local stand and market, Twin Springs, has the first of the really great tomatoes available and the difference in using fresh tomatoes compared to canned is insane. You can use canned in a pinch, but it never really tastes as good. I dice one onion and two cloves of garlic for every five large tomatoes. If I have more ripe tomatoes I make more sauce to have in the fridge for pizza, pasta or another lasagna. I first brown the onions and garlic with olive oil and then add the diced tomatoes with ample salt and pepper. I let it simmer for as long as I can or until the rest of the ingredients are assembled. While the sauce is going, I then start the filler for the lasagna. This part is completely dependant on what I have in the fridge. If I have fresh cauliflower, I usually make a puree that acts as a ricotta cheese. 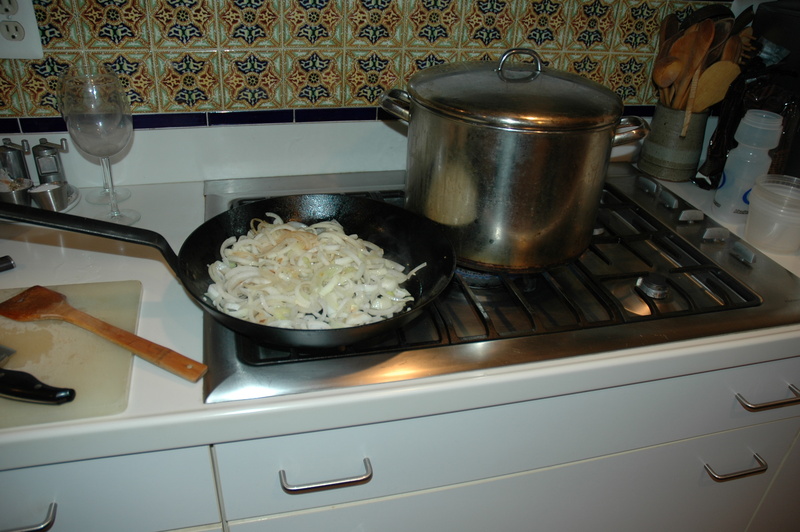 I first chop another onion and put in a large pot with the chopped and cored cauliflower, salt and pepper. I cover and use a medium flame stirring often. It takes about 20 to 30 minutes to get really soft. This is the same way I make our cauliflower soup in the fall, but I don’t add water so it can be really thick. 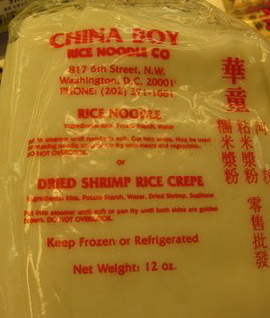 Once the ingredients that take the longest are cooking I boil the water for the noodles. If I have a couple hours to bake the completed dish, I cook it half the time suggested or until it gets soft enough to flex. I like the noodles to get crispy and if I have enough time in the oven, the tomato sauce and filling help cook it the rest of the way. When the noodles are done and if I haven’t cooked them too long, I can just rinse them with cold water and put aside until I am ready to assemble the dish. Next step is to chop more onions. Spring onions are now available and I love to add them to the dish in the filler. 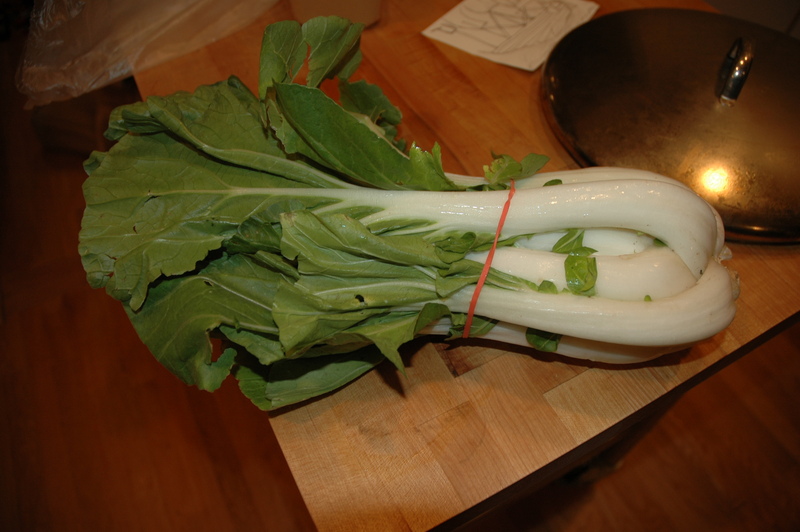 You can use regular onions, but the green stems are very tasty. 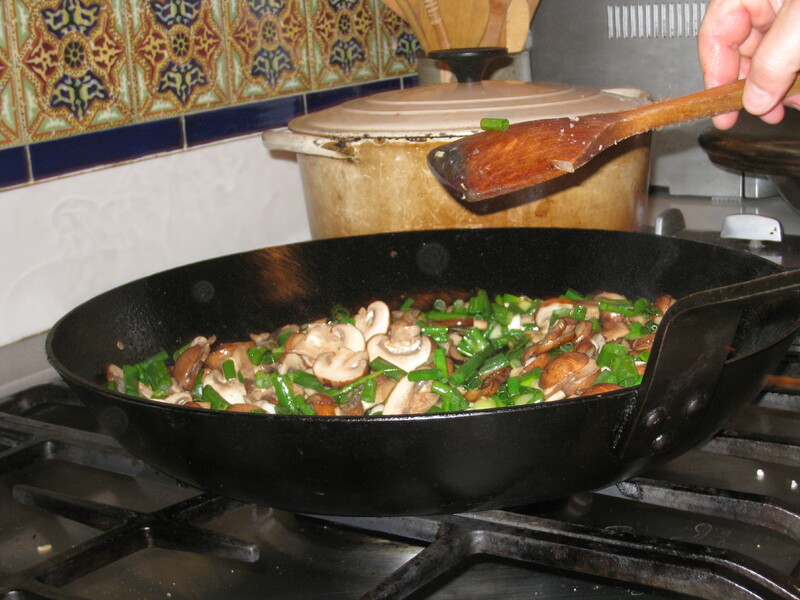 I will add fresh garlic and mushrooms. If I have a green like spinach, chard or even kale, I can add as well. It really depends on what the market has or what I have in the house. I always start with the onions and garlic in a large skillet with olive oil, salt and pepper and then add the mushrooms and or chopped greens. While it is sautéing at a high heat I go back to the sauce and filling base. The timing works since you can cook the sauce and the cauliflower longer without hurting them. 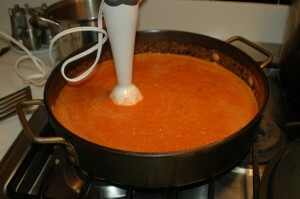 To finish the sauce and filling I use a hand blender. I can’t recommend a tool more than a simple hand blender. Prior to this mixer I used to consistently destroy kitchens and burn the crap out of myself by filling a regular blender with hot stuff to mix. It was comical how it exploded until you realized that surfaces of the kitchen that you didn’t know existed were covered with sauce of filling. Cleaning it up was hard while applying ice to your third degree burns that you sustained when the top flew off of the mixer. 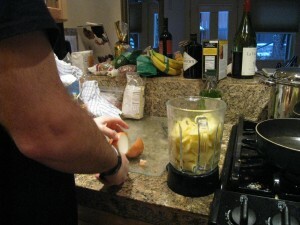 With the hand blender you just put it in the pot you made the sauce in and mix away. You also have one less thing to clean which is awesome since you will have five massive pots and multiple other things to hand wash after you make this dish. My wife also says I use every pot in the house regardless of what I make. I usually blend the tomato sauce first and keep it simmering until some of the water evaporates from the sauce. 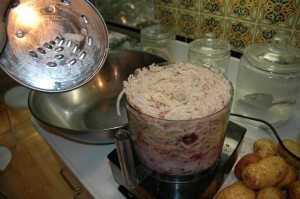 I then rinse it off and blend the cauliflower. 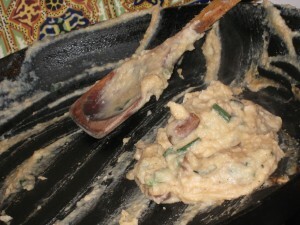 I need to say that the cauliflower can be substituted with pureed white beans that I have written about before. 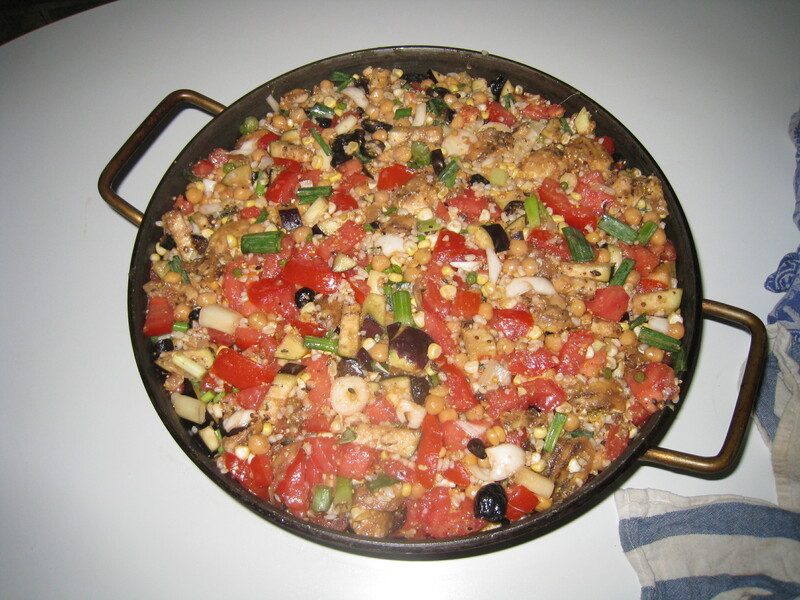 I always have some pre-made in the fridge or freezer and using them adds more protein to the dish. 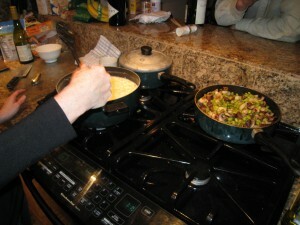 I now add the cauliflower or white bean puree to the hot onions and mushrooms and stir together. Once mixed in I turn the fire off and lay the first of the lasagna noodles in the bottom and sides of my well olive oiled baking pan. 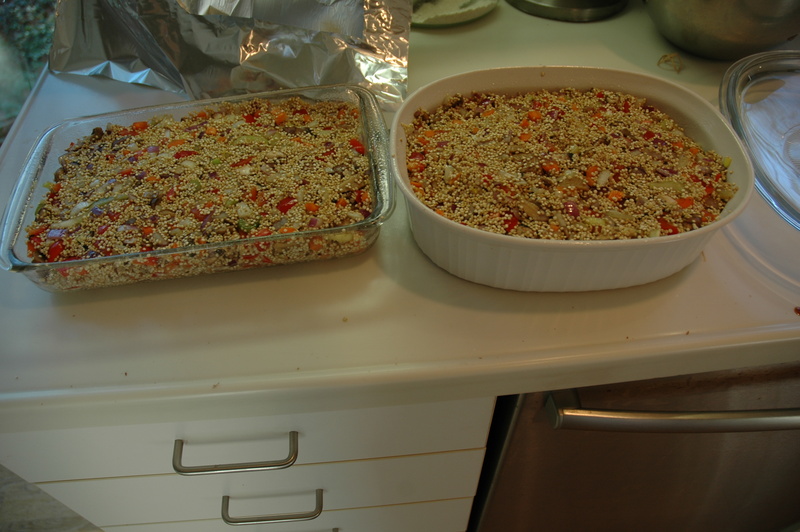 I try and completely cover the bottom and sides so the mix doesn’t stick to the bottom or sides while cooking. Depending on how deep it is or how much filling you have you can do multiple layers but I usually do just one. 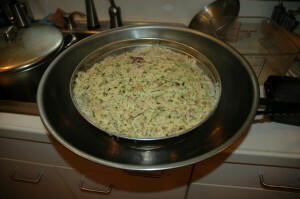 I then carefully add the mix of mushrooms and whatever else I put in the pan on top of my base noodles. 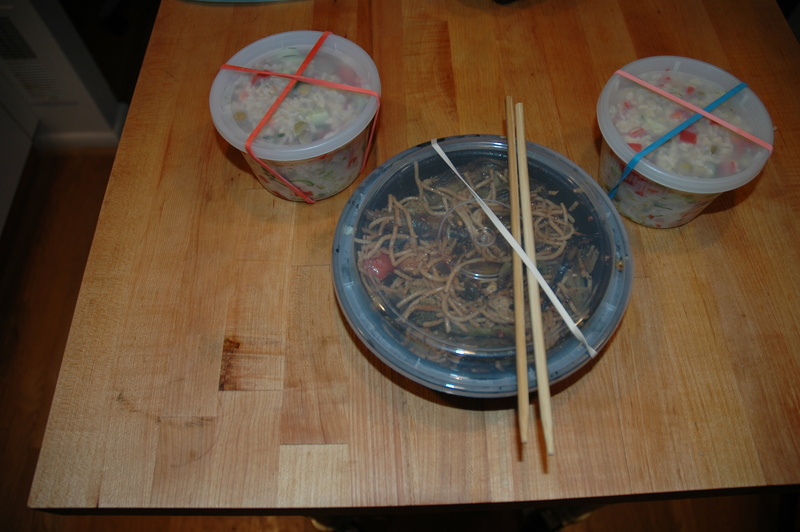 I take time to make sure I don’t slide the noodles around too much. 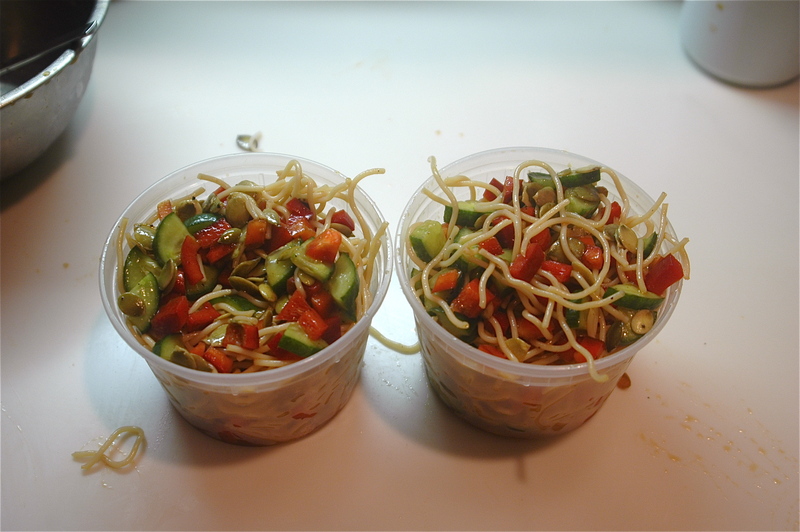 I then layer noodle on the top of the mix. Now it is time for the tomato sauce, which I lather thickly on top and make sure there is enough to cover all the noodles thickly. On top of that I put grated cheese. I usually use a hand grater and do it directly on top and then spread it out by hand so there is even coverage. You can use your favorite mozzarella. We keep it vegan with a soy version, but you can do whatever. Depending on how much time I have until dinner I adjust my oven. I have to say that if I need it quickly and we are ready to eat I crank the oven up to 450 on convection bake. 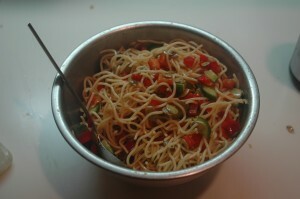 If I know I don’t have as much time as I would like to cook, I will cook the noodles a little more to save oven time. At a high heat this can be done in 30 minutes. You just need to watch and make sure the top isn’t burning. If I have more time or need to do a pickup or drop off with the kids I put the oven at 350 and go. I can leave for two hours if I slow cook it at 300 and finish with a little broil to crisp the top when I get back and shower the troops. As long as you don’t burn it this dish can be tweaked and neglected for hours. I like it with a big red from Southwestern France if it is cold out, but if spring is in the air you can do a lighter Chianti or northern Italian red as well. I also like to eat it with a simple salad to contrast the temperature of hot and cold. Even if the temps get too hot to cook inside, we have been know to make this dish on the grill and use all the fresh greens that the summer provides. Either way Virginia has leftovers to take to work and the kids have a weekend lunch as well. We don’t usually get sick. We have had a serious long run of no illness but that all changed last week. I should have know that we were in for something when Sasha declared he was too tired to go to ski training last Tuesday. As any good parent would (and without the protest of a more responsible mother present), we went skiing. 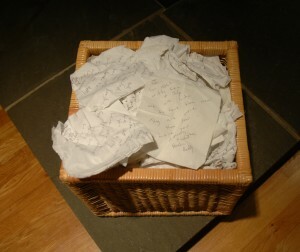 That night as we returned home, I knew I had made a mistake. Sasha had a fever that quickly escalated to a 104° fire inside his body. He was out the rest of the week, and I destroyed the weekend as well. A trip to his Dr. on Saturday didn’t provide us with the answers and drugs to knock it out so he just had to sit and simmer for 6 days. The whole time we were waiting for the other shoe to drop…..for Noah to get infected. On Saturday I thought we had dodged a bullet and my mistake was that I said as much publically only to be reminded on Sunday that if you have one sick kid you will soon have all sick kids. In our house sickness means you get to eat whatever you want whenever you want. 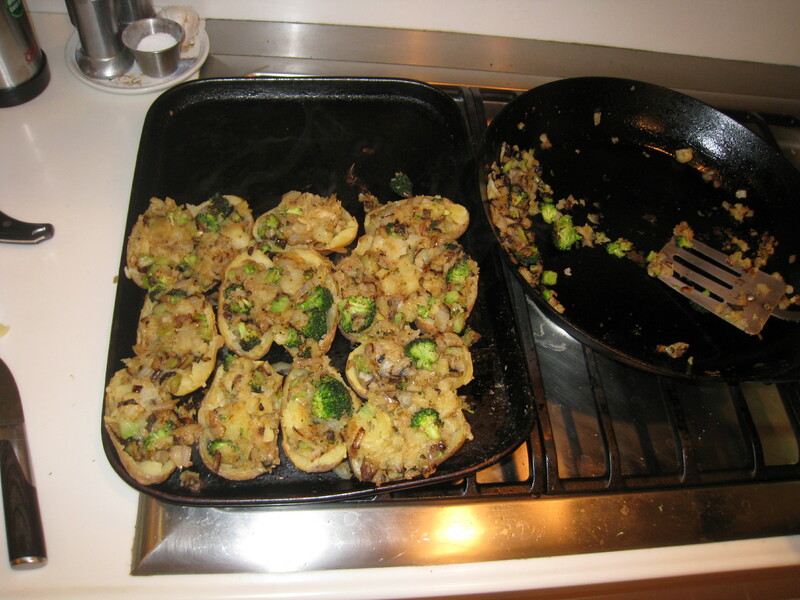 When Noah and I were away on Saturday at ski practice, Virginia made Sasha twice-baked potatoes. 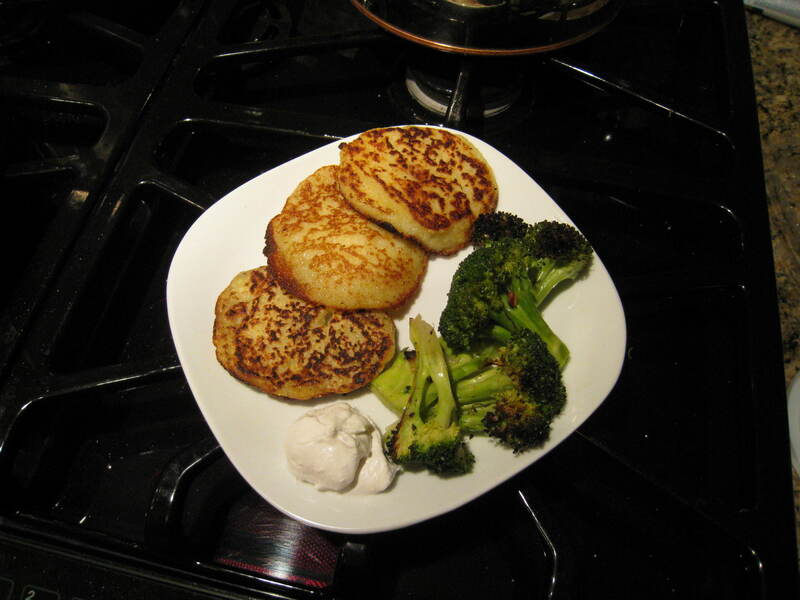 While potatoes are a huge hit in almost every form in this house, the kids have never had twice-baked potatoes. When the same hit Noah on Sunday night just as Sasha seemed to be getting better, I knew that I would also be doing my share of comfort cooking. Noah was told of the twice baked and I think he got sick just so he could have one. I made one the first day, and think I rocked it. For our potato you need to use a real oven. You can’t microwave a baked potato and expect it to be good. I wash them and put them in a 400-degree oven until it is soft. It really does depend on the size so it can range anywhere from 45 to 90 minutes. Once it is soft, I slice it in half and burn the crap out of my hands scooping out the hot potato. You don’t need to get it all as a little left inside keeps the skins structure, which is important when you stuff them. I add the scooped out potato to a pan that has broccoli, onions, mushrooms and garlic sautéed with ample olive oil, salt and pepper. 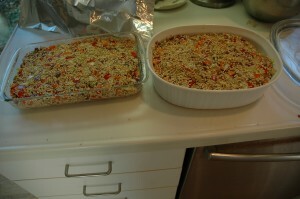 I mix it around until the juices are combined and then re stuff the skins on a baking tray. You can top with cheese or not and then convection broil until golden brown. We serve them with fresh guacamole and a salad. In addition to the baked potato, Noah also wanted a Panini sandwich. When Virginia’s mother died we kept her Panini maker. Not sure if it was ever used, but it has become a favorite of the kids especially when they aren’t feeling great. Sounds easy enough to make a sandwich and then put it in the maker and go, but in this house you need to make the bread first. Noah wanted a Panini so we made bread in a loaf as I have posted before. 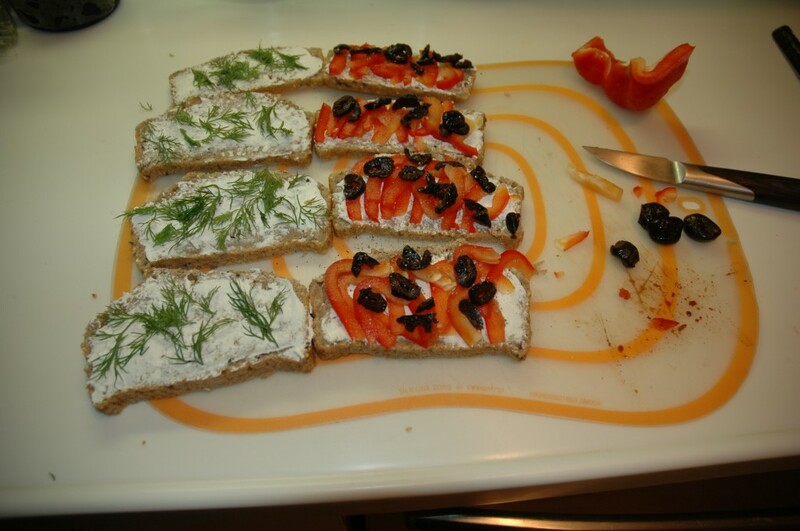 It is a pretty simple sandwich once the bread is done. We use soy cheese to satisfy our diets and then always put in a veggie. 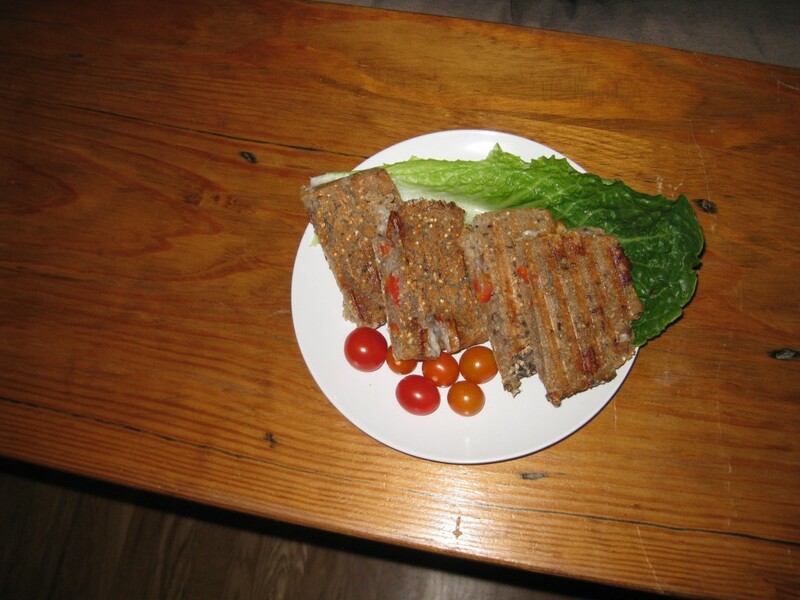 We had red peppers and I sliced them thin and put it in the sandwich. I then Paninied them until they were toasty. It does make a good sandwich. 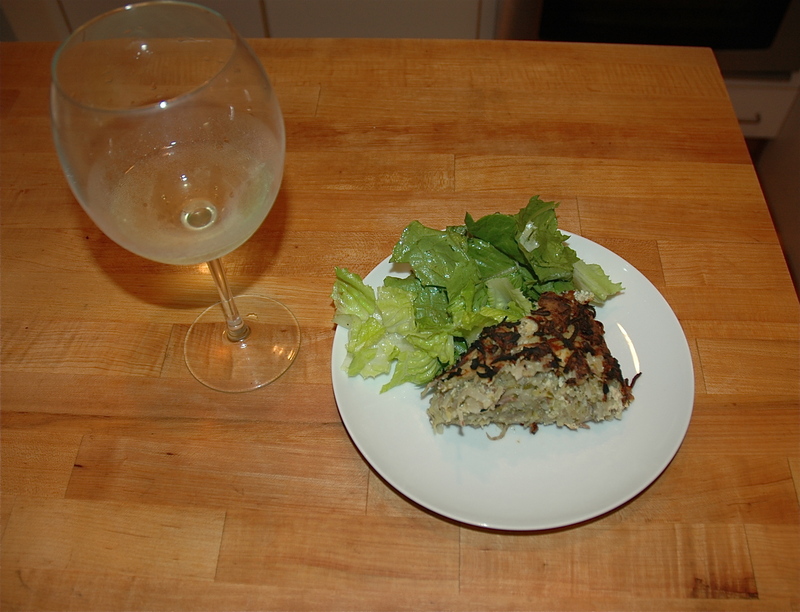 I then put it on a crisp Romaine leaf and had some great cherry tomatoes from Twin Springs. Both the kids love Dijon so I put a Dijon dip together with a little Rice Wine to give it a little moistness. Problem is I start eating them as well. 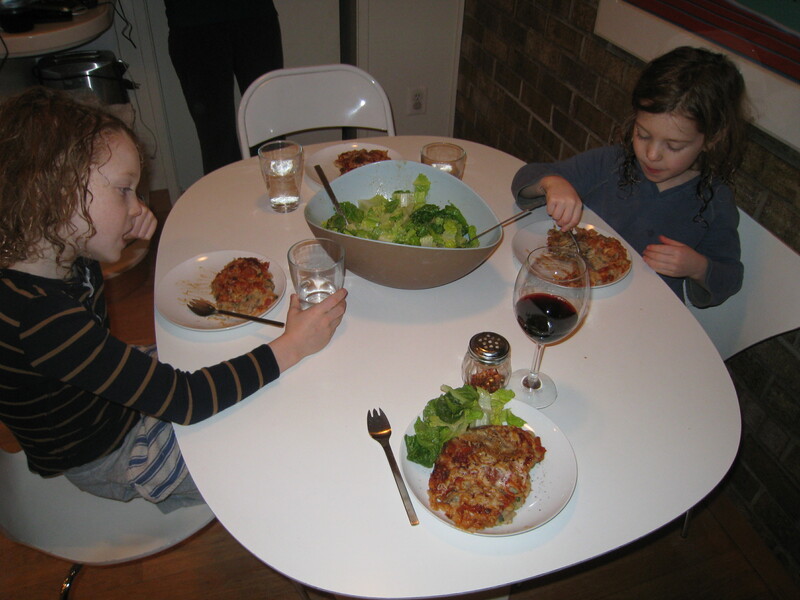 In fact I end up eating all day long with the kids and feel a different sickness when they are home from school. 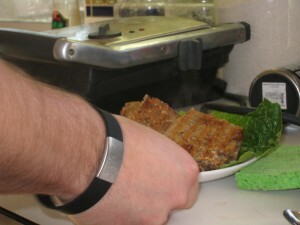 It isn’t that our comfort food is bad for you, but the constant eating and cooking makes me sick. I have no control and always need to taste everything I make. If it wasn’t constant consumption I would be fine. Fortunately everyone recovered and while Virginia finally got hit, I was able to slip through without getting it full blown. I think the virus knew that someone needed to cook. 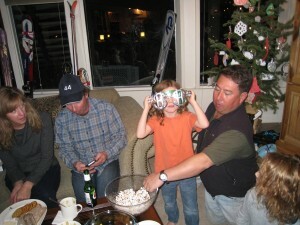 For the last couple of years we have been really lucky to spend the holidays in Aspen. I know how lucky we are. It is our very favorite place to be, and the only drawback is we can’t take our dog Samantha with us. Every year we rent a condo from an old college friend who runs a real estate and property management company in the Aspen Valley. Tim at Frias Properties has taken care of us for the last eighteen years. Be it for a long weekend or an extended stay, they have more condos in town than anyone. For the last three years, we have stayed in one that is very close to the gondola. Not only can we see all of Aspen Mountain from our window, but also we can walk to the lift in our ski boots.Most of what you have heard of Aspen is true. It is an amazing place that has some of the best skiing, food and culture in the world. It is home and playground to the rich and famous, but it is also home to many locals who live in a community that is old and grounded. In DC, most people work for or are connected to the government in some way. 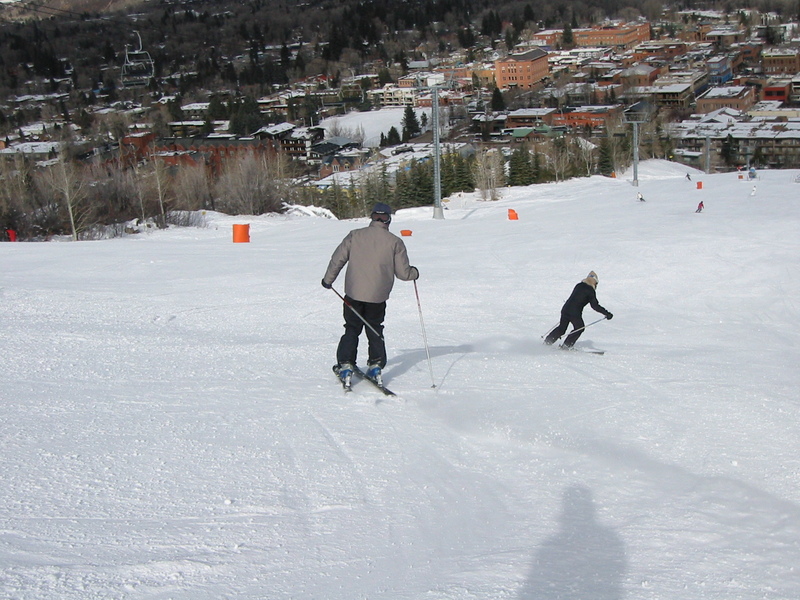 Aspen has a similar relationship with the ski industry and many friends work directly and indirectly for the industry. Those who live there are part of a town with an incredible history and vibrant local population. Our family is very lucky to feel a part of this community. I went to school with many locals who were born and raised in a town that attracted adventurous people who were seeking a lifestyle and way of life that is truly unique. Most of my friends were delivered by the only physician in town, Doc Crandle , who treated a serious throat infection I developed while visiting Aspen in college. This incredible place has the ability to integrate different economic classes better than most places I have seen. The ski hill is the best example of this. If you are a ski bum working 5 jobs, as I once was, and can barely scrape together enough money for rent and food you ride the same gondola car as the guy with the 12 million dollar house who has his own jet. You get on the hill and in some ways you are equals. I have often seen the power structure shift to favor the lower guy on the economic scale as the rich guy usually can’t ski as well or doesn’t have the local knowledge of where to ski. Regardless, once on the hill there is no hierarchy based on wealth. That being said, we can’t afford to eat out every night. Condo cooking is a fun way for us to relax at the end of day and enjoy food with our friends and family. The challenge is that we don’t have the pantry of our home that has the incredible depth. 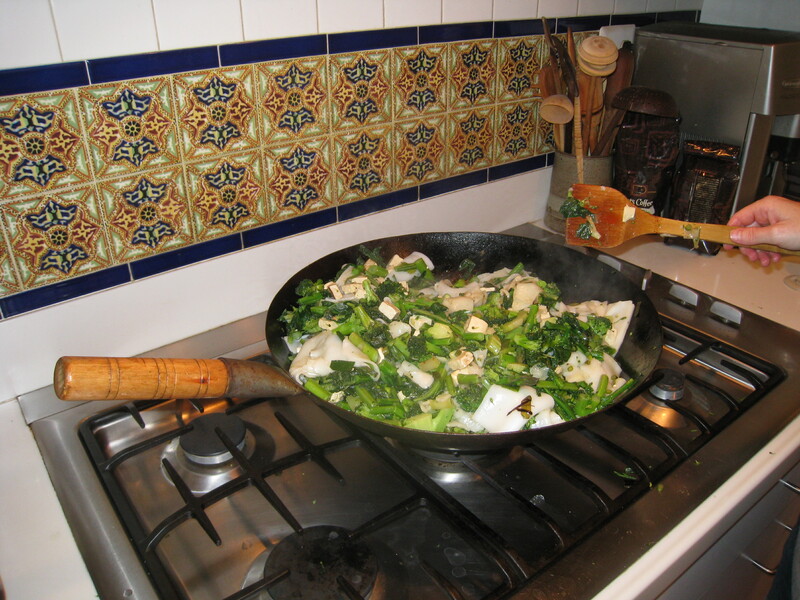 In some ways it makes cooking more simple and basic, which is good, because we are usually very tired at the end of day and cooking for hours on end isn’t preferable. The other thing that influences our condo selection is the proximity to the market. Aspen has two main markets. 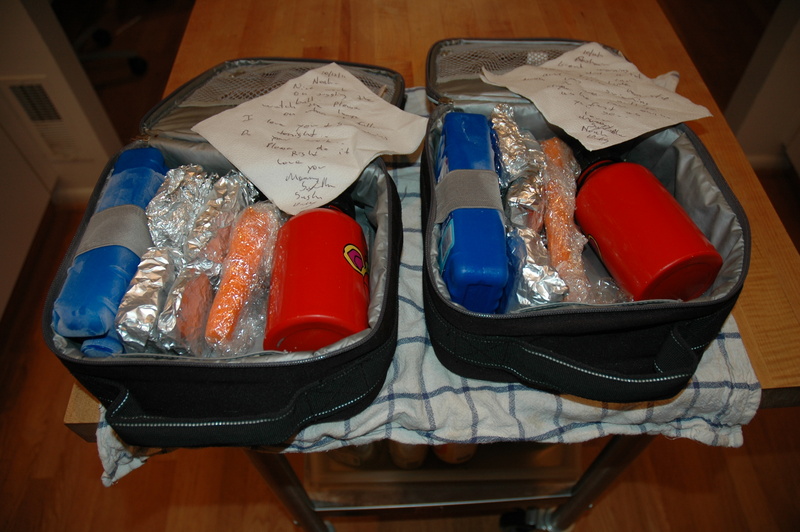 We usually need to go to both in order to make our meals for the whole week. The City Market is your basic Giant or Safeway with a decent number of items. Generally we can find better produce since Aspen is closer to CA than we are in DC. We also continue to stay here since it is only one block away and opened 24 hours (we are usually there two times daily). I have a bonus card that gives you amazing savings and we bring it with us every year. Clarks is a little further, but has a better gourmet/vegan/asian/gluten free section. We always need to visit Clarks for the gluten free soy sauce and spices as well as things like Arborio rice and polenta. 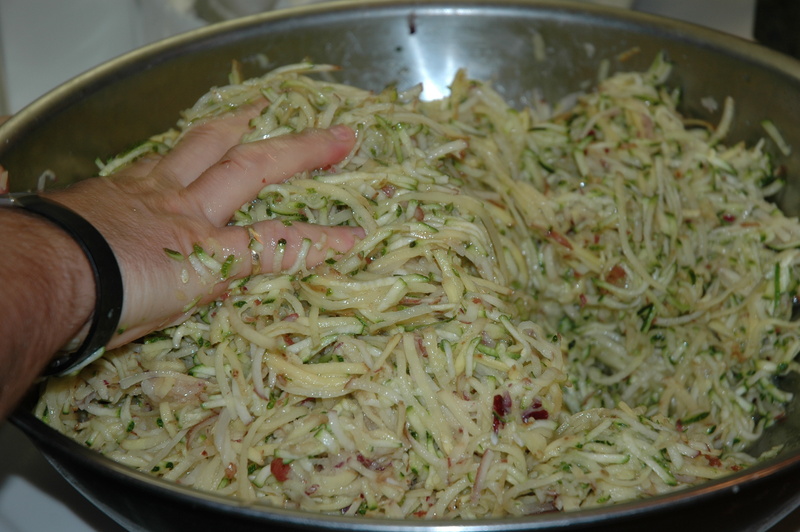 It also has a better selection of specialty produce like mushrooms and shallots that we use for some of our meals. Since we usually have lunch on the hill or come back to the condo for leftovers, we generally just do breakfast and dinner. Breakfast is basically the same as home but with more options. Virginia will make her gluten free muffins and we will have pancakes or oatmeal depending on what the kids feel like eating. If we make pancakes we always do a gluten free version with almond flour and corn meal and a regular of almond flour and whole wheat. You never know if Buckwheat will stop by for some breakfast before skiing or after an early morning skin up Buttermilk. We also always have humus on a toasted English muffin or pita for Howie if he makes it over in the morning. We have a few go to meals when we are there, consisting of warm, winter dishes that are easy to make and universally loved by our local friends who eat more healthfully when we are in town. 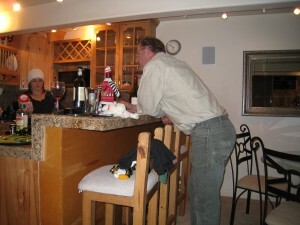 We typically have après ski in the condo and everyone stops by after work or skiing for wine and snacks. The condo is small and cooking and socializing can all happen at the same time. Usually Virginia stops skiing a little earlier than the rest of us and gets the après set up. Truffle oil popcorn is a staple in Aspen. 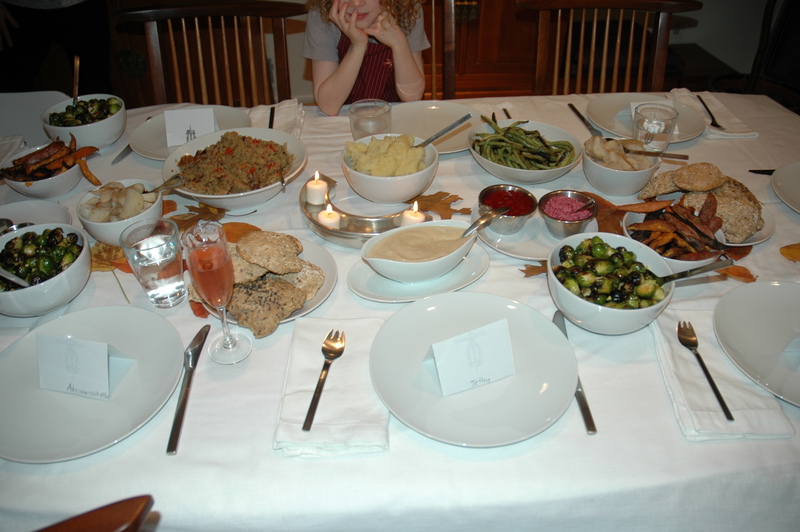 Crackers and dips are also a mainstay. 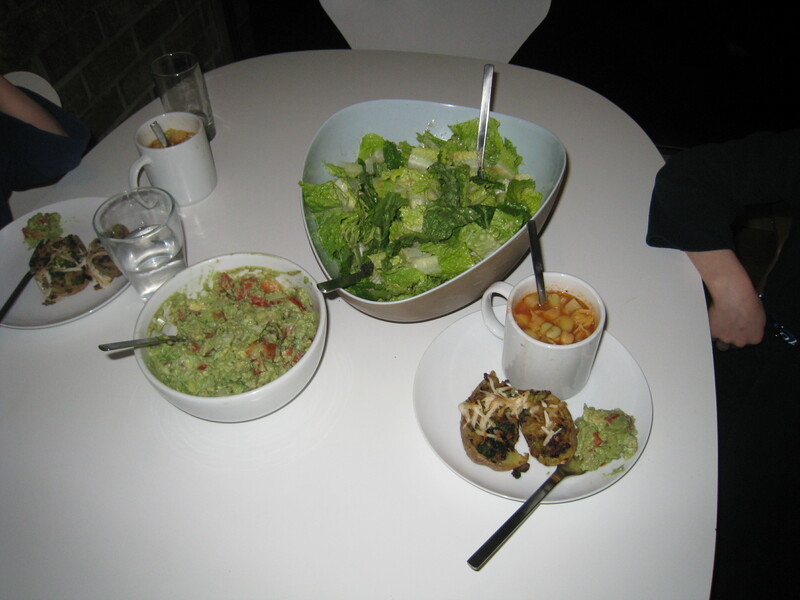 We usually have a white bean or hummus dip, olive tapenade, and guacamole and salsa. Sometimes we even have cups of warm lentil soup. The trick is not to stuff your self with the snacks before dinner. 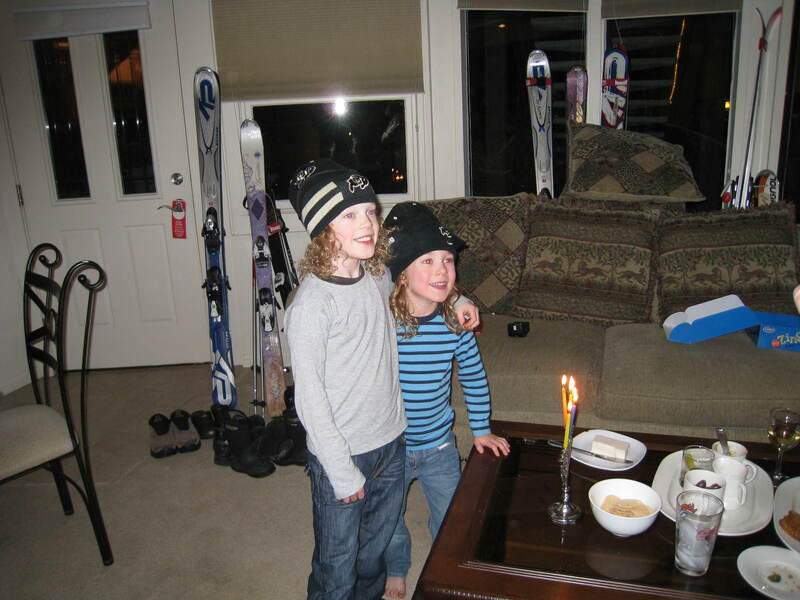 This year Chanukah and Christmas overlapped so we celebrated both in our own secular style. 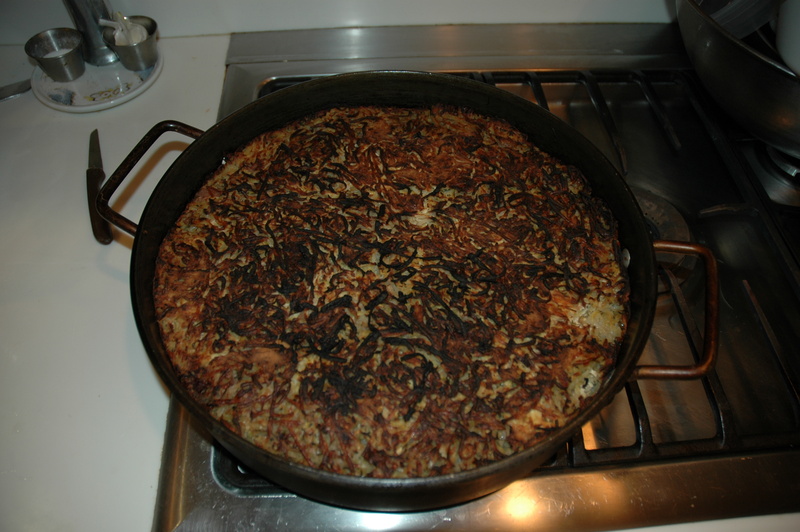 We decided on potato latkes our first night. Our condo this year was outfitted with a blender so we developed a new way to make them. Pealed potatoes, an onion, salt, pepper and a little corn meal was all we needed. The knives and pans are always an issue, so part of the challenge is making do with what we got. 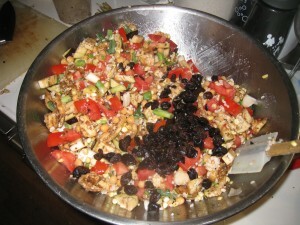 We were able to blend it all by adding a little water and olive oil to the mix. We then made pancakes and served them with roasted broccoli, romaine salad, and topped with either tofu sour cream or salsa. We are not applesauce on our latkes kind of people, but if you are you can cook them in veggie oil and not add as much salt and pepper. Jew or non Jew, who doesn’t like potatoes? The meal is filling, and even though we had tofu sour cream it wouldn’t have been enough protein had we not had the hummus and warm lentil soup as a snack while we were cooking. Another tradition we have is Christmas Eve risotto with Howie, Minnie and Hooper. While I usually cook most of the meals, this is truly a Virginia dish. I am not always a fan of risotto since I feel like the Arborio rice is too white, but it has become a tradition that has grown on me. 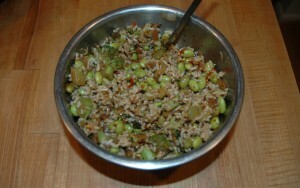 We have made brown rice risotto, but it really isn’t the same. This dish is a little different than we would make it at home. Our dearest friend who usually has every meal with us when we are in Aspen has gout and one of his no eat foods is cauliflower. The cauliflower, which has appeared in many of our posts, has the ability to give richness and creaminess without using cream or cheese. For Howie, we do without. Since we don’t have a risotto pan, we sauté mushrooms, garlic, pearl onions and frozen limas in a pan at the highest possible heat so they get caramelized and crispy. In another shallow pot we put in the Arborio rice with onions and garlic and slowly add white wine and veggie stock while constantly stirring. This process takes some serious time and attention, but with everyone in the one main room eating snacks, drinking and telling stories of the day, it is fun and easy. As the rice starts to look translucent and absorbs the added liquids, we taste to see if it is close to being done. 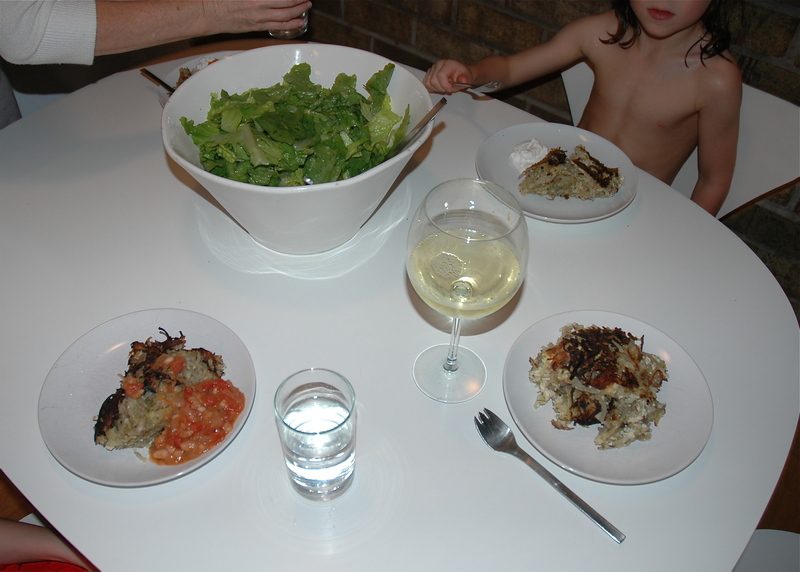 We would add the veggies sooner if we had our at home risotto pan, but we make do with the tools we have. 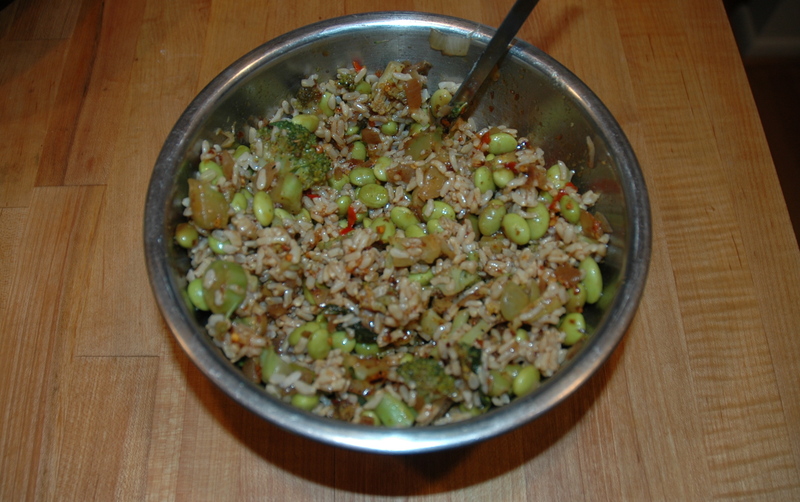 It is important to get all the juices from the sautéed veggies into the rice mix. We then cook together until done. This is one of the few dishes we plate and we usually drizzle some truffle oil on top and sprinkle a little fresh basil. We served with roasted asparagus and a salad. Sadly I didn’t take pictures, but we usually make risotto balls the next day. Since we are burning a serious amount of calories skiing all day we don’t feel so bad about the carbo overloading. We take the cold leftover risotto and form it into golf ball sized balls by hand. I then coat in corn meal and put on a well oiled cookie sheet. We then broil them in the oven with the door cracked and turn them so they brown evenly. Even though they have the same ingredients as the risotto in its non-balled form, it tastes totally different. If there are any left, they also make a great breakfast. I will continue this series with different meals that you can make with a few ingredients and crappy pans. Truth is that we usually enjoy what we make more than what we get when we go out to most places. Nothing beats having Gloor and Maggie stop by for a visit, staying for dinner and chowing on vegan gluten free meals and having Howie and Hooper fall asleep on the sofa. Noah and Sasha are always ask with concern if it is just us for dinner as they look forward to having the gang every night. It is fun, however, to get out and see the other side of Aspen and rub shoulders with the same rich and famous you saw on hill and our annual tradition of Christmas cocktails and a wonderful dinner out hosted by Jim with Mary, Dan and the Louderback family is an event we look forward to and hope to never miss. If you overlook the invasion of the Native American and subsequent conquest of America and transform it into just a day to be thankful, than you get one of my favorite holidays. Along with Halloween, this season has my two favorite non-denominational traditions of the year. Whenever family, food and wine are the focus, I am pretty happy to celebrate. I have only missed one Thanksgiving at home since I was kid and we have now tried to rekindle the tradition of having family, friends and stragglers celebrate with us. As a kid this always included foreign nationals who had no Thanksgiving tradition of their own, but wanted to experience a traditional celebration. I have said time and time again how lucky I feel. In spite of not having any of our parents and also having had my grandmother die on Thanksgiving, this holiday helps me remember and celebrate what we have now and what we had before. Besides our family we have a tradition that we established in 1988 when my mother came to spend Thanksgiving with me in Madrid after my father died, and I had just returned to finish my studies. She met a wonderful man who was on his way to spend the holiday with his parents and after cancelled flights and a boarder detention, a new tradition of spending the holiday with this now family of five had begun. Even when we had the restaurant and we would close for the night and have all the employees and their families come, we were joined by our friends and even some of theirs. 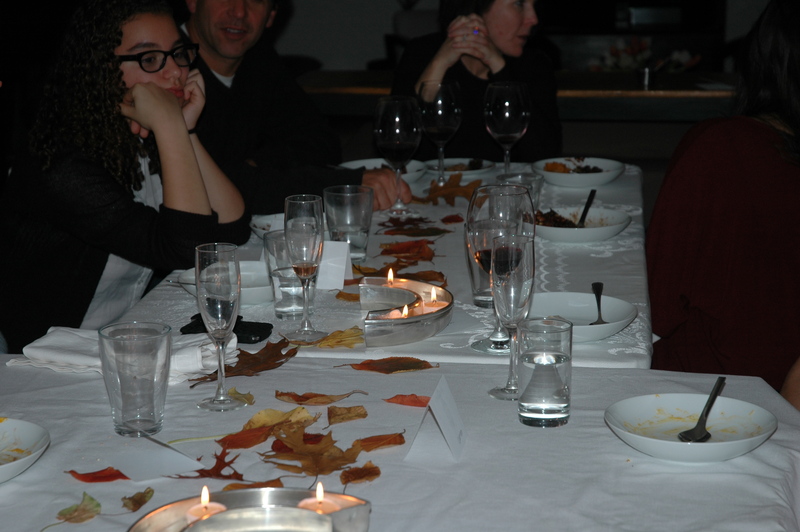 We also have a tradition of going around the table and saying what we are thankful for. We always have tears, laughs and shared memories. I hate change and having the tradition and the traditional dishes that have morphed into a vegan and mostly gluten free meal are something I look forward to every year. 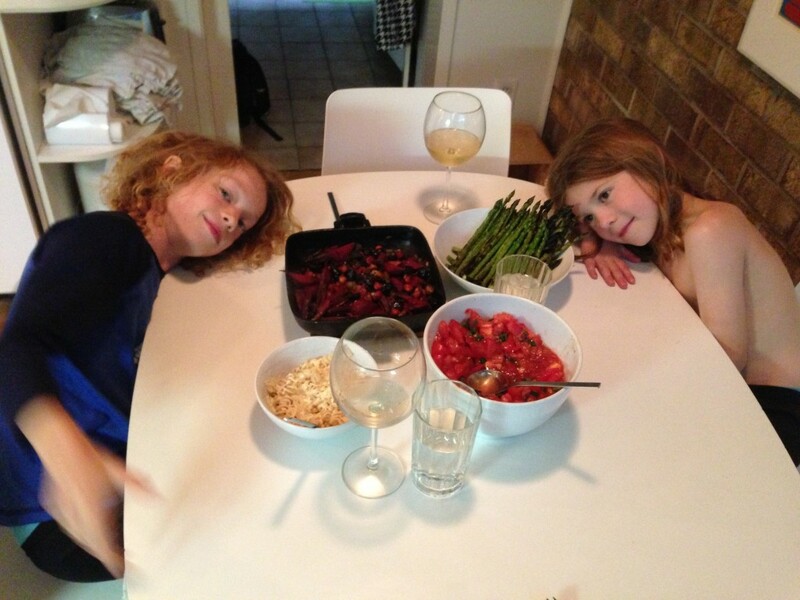 Fortunately, as Virginia tried to make some changes to the menu she was met with cries of no from our kids and myself. We generally cook for hours the night before and pretty much all day until the folks arrive. The night before is usually reserved for the stuffing which is the protein source and turkey substitute for us. Nobody who has joined us has ever complained or missed their bird after our meal. We start by prepping the chestnuts. This is the most painstaking process of the meal and it can be eliminated by buying the pre-prepped and very expensive shelled and jarred French chestnuts. If you are a purist you score the tops and bake them in the oven. 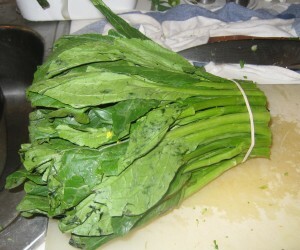 We have cut them in half and boiled them, steamed them and roasted. Regardless of which method you use, you will inevitably sustain an injury to your thumb from pealing the hard shells. 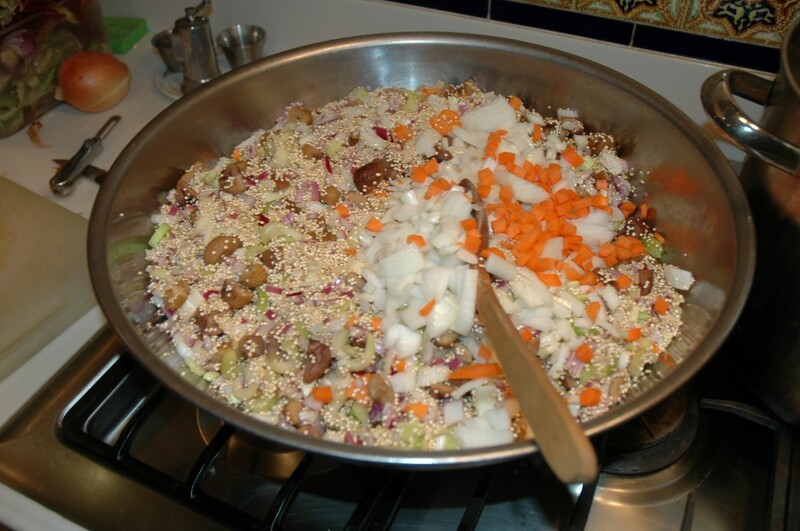 In a large bowl we mix quinoa, which is protein packed and the basis for our stuffing with leeks and or onions, celery, red peppers, carrots, chestnuts, olive oil, salt, pepper, fresh thyme, oregano, and the corn stock that I featured a few weeks ago and had in the freezer. I combine it all together and let it sit refrigerated all night and mix when I can. I then put it in a few large oiled pans since I never have enough space in just one and since I send some across the street for a sometime vegan who wants it. I bake it covered for about three hours and uncovered for about and hour so it gets crispy on top at about 350. The sides always include root vegetables, which are turnips, parsnips and beets if Twin Springs has them. We always do olive oil mashed potatoes with the local spuds. The last three years we have been really lucky to get the most insane string beans ever. They are about 9” long and are fantastic. 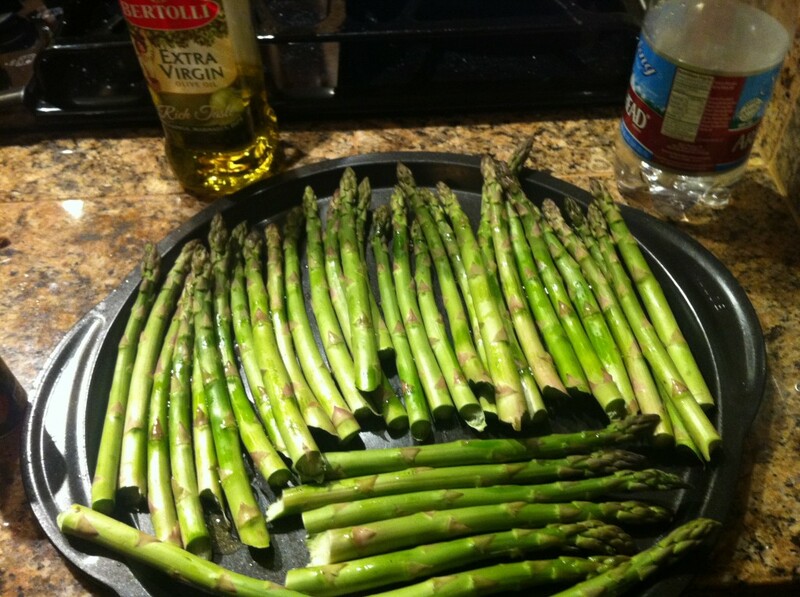 I cook them on a hot grill for just a minute with just grapeseed oil, salt and pepper. 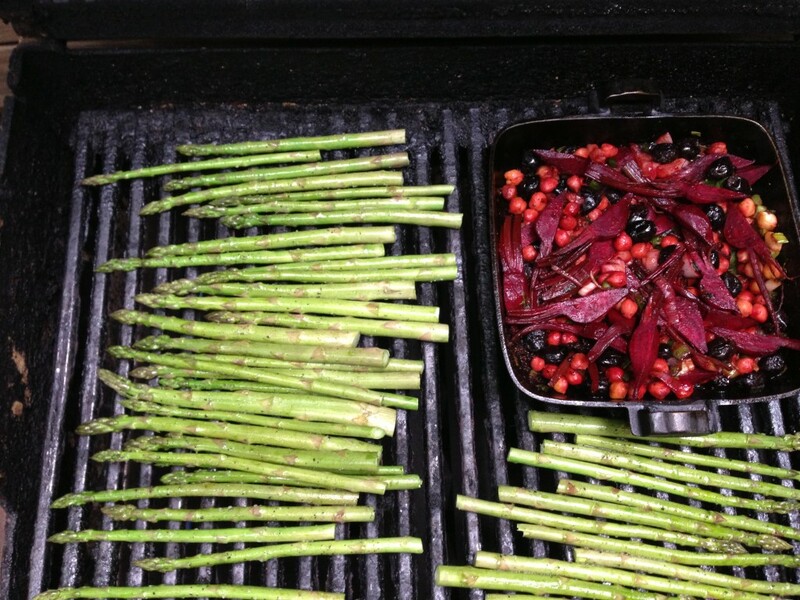 We also use the grill for the brussel sprouts and then add fresh ginger and rice wine as a spice. We always do a green and this year my sister brought a mix of fresh ones from her garden and lightly wilted them. 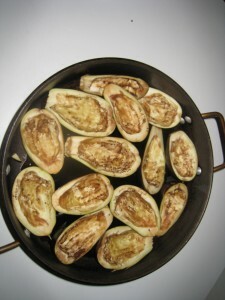 The kids love sweet potato spears that we grill as well and have become a serious favorite. The only non-gluten free item is the rolls. The evening with a cauliflower soup that is just cauliflower, onion, salt, and pepper and then pureed until smooth. 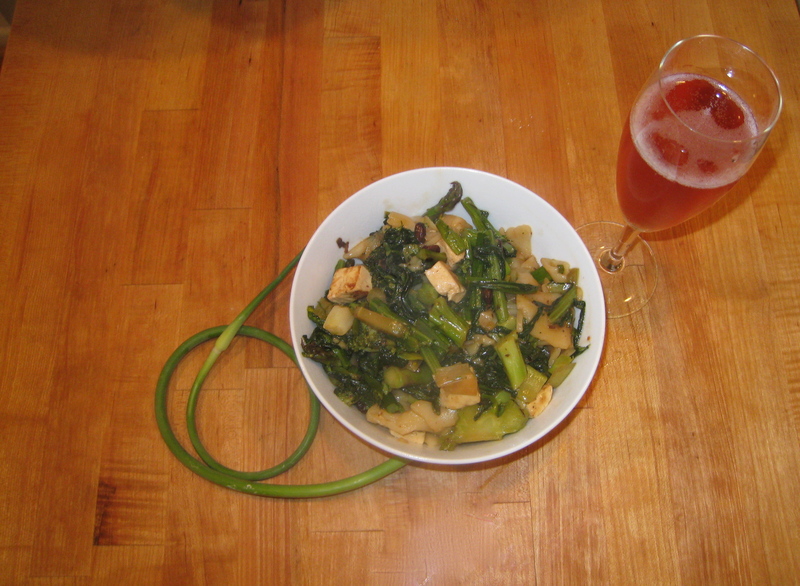 We serve it in mugs and pass sparkling Rose from the Jura as everyone arrives and I grill like a maniac. Our dinner wine this year was Bordeaux that was fantastic with dinner and deserts. 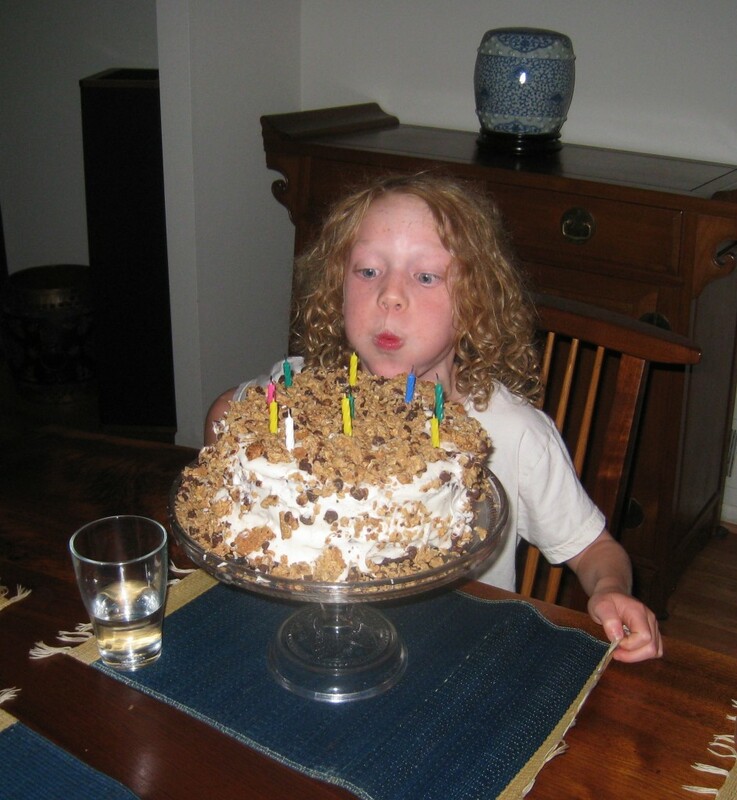 For deserts this year Virginia out did herself. Our pumpkin pie was a combination of kabocha squash and butternut squash, which we roasted and peeled early in the morning. 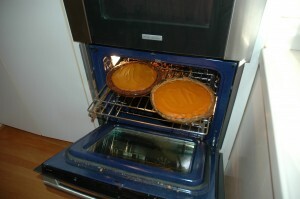 She had mad two different crusts and therefore two different pumpkin pies. One was chocolate chip, oatmeal and pistachio crust and the other was almond. 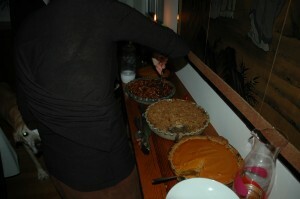 She also made an apple pie with amazing Fuji apples from the market and then a pecan, chocolate and bourbon pie. It was an insane meal and I can’t wait for next years. This year they were owls. Why owls? It started with a school art project. Noah was making an owl mask and decided he would complete the theme by being an owl for Halloween. And that meant so did Sasha. I make their costumes every year and try to help steer their decision towards what I think I can get done. But in the end it is their decision, and I always make what they want. 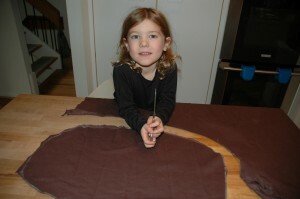 I had hoped I would be able to hand down costumes like clothes from Noah to Sasha each year, but that didn’t last. They now both want to be the same thing. I love and hate Halloween. Without a doubt it is the kids favorite holiday. They love it as much as my father did. For my dad, Halloween was the one time of year he could be the actor – an unfulfilled passion of his. He would dress up every year in a different elaborate outfit. Usually it had an international flavor, but a man in character always accompanied it. Accent, dress and attitude fit the costume. It was fun. My kids somehow have developed that same love of the holiday. Starting on the day after Halloween they start planning their outfits for the next year. It always changes about 10 times, but it doesn’t matter since I can’t seem to get started making them until the last minute. For whatever reason I decided to make Noah’s first costume. 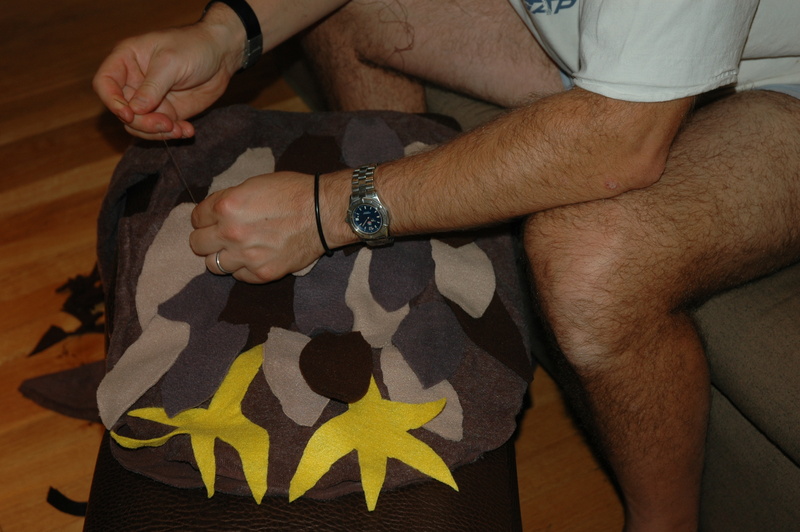 It wasn’t very elaborate, but I did sew the entire thing by hand. A simple pumpkin that was an orange sack with a matching hat that had a stem. It wasn’t too hard and I could sew all night since he was always up feeding, and I could keep Virginia company as she fed him. That started a tradition that has now morphed into a basic need; much like food and oxygen is for our children. It isn’t an option for me not to make their costumes, and their level of appreciation doesn’t match the effort required to make two outfits by hand. I have also come to realize that each inch of height they gain requires more stitches and more time. I should have learned how to use a sewing machine. My grandmother was a seamstress and made men’s suits in a sweatshop when she first came to this country. She continued to work in an After Six Formal Wear factory in Philly until she retired at the age of 65. She never stopped sewing and had a wonderful Singer sewing machine that used a foot pedal to operate. My sister has it now, and I am sure it still works. 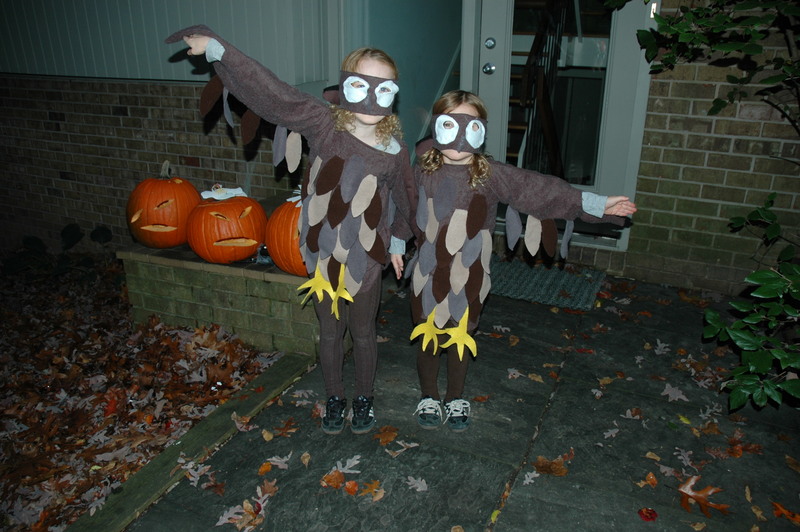 In some way, I think my devotion to their costumes is really a tribute to the two people who loved kids, Halloween and sewing and sadly can’t see my kids enjoy this day as much as they would have. Maybe that is why I feel like I have to do this. Honor my dad, grandmother and try and compensate for the fact that my kids don’t have any grandparents. So my method for whatever the costume is remains the same with a few exceptions. 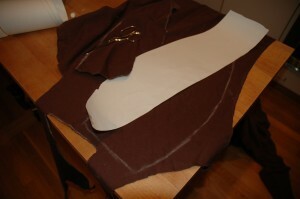 I have done the glorified sack construction and added armholes, leg holes and this year sleeves. With each step I add hours if not days. 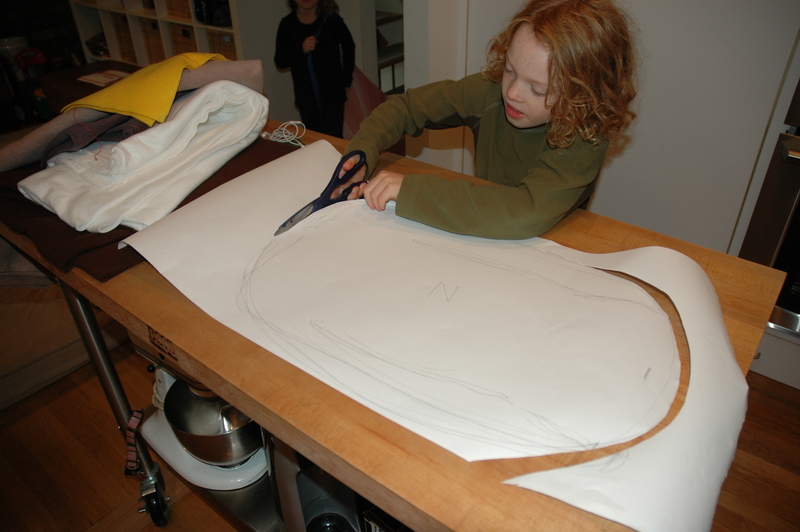 I start by laying the kids on paper and outline their bodies. If I have this I can do whatever I need to do without having a fitting. I then need to have a vision of what I am doing which changes with the reality that I am not a skilled tailor. I am getting better with each year, but I am still very slow. While I am in the Halloween season I don’t do anything else. Work, exercise and sleep suffer big time. I don’t have much left in me after so our meals also suffer. Quick and easy take over and there is nothing more quick or easy than soup. I can always put a soup together without too much difficulty. 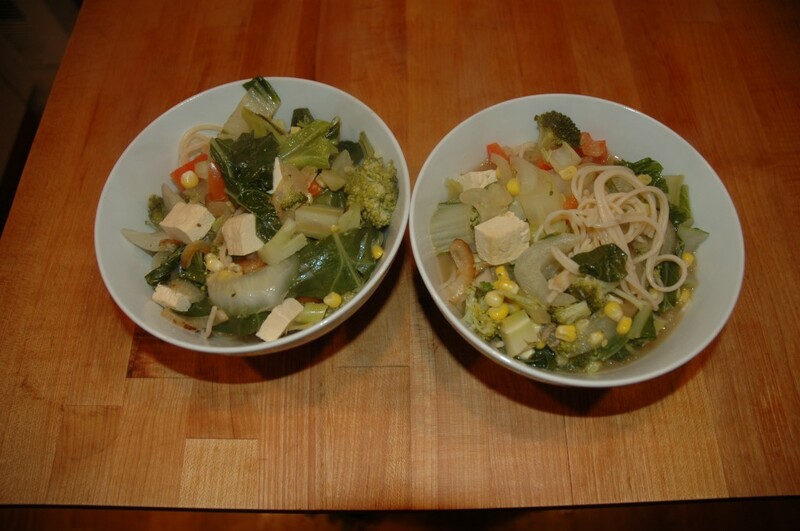 One of our all time favorites is the Asian Noodle soup. Like everything we do, it is totally driven by what Twin Springs has, but we can also do something decent without the awesome freshness of the local stuff. I usually first cook the noodles. 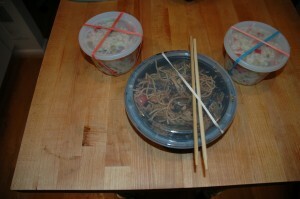 I love to use black rice noodles from the Asian market. You can use any rice noodle, but we only had the potato, rice and soy spaghetti so we went with that. Instead of straining them, I use the noodle water as the soup base. The starch from the noodles adds to the soup structure and you feel good about not wasting water and fuel to double boil stock. We sauté the onions from Twin Springs, which we can get most of the year. If you sauté them first in a little grapeseed oil in a separate pan you get a real richness to the broth. To the pasta water I add a little miso, soy sauce, sesame oil and mirin. It is really important not to cover the pot when you put in the veggies. You want to maintain their color, flavor and shape, which can’t be done if you cook the crap out of them. 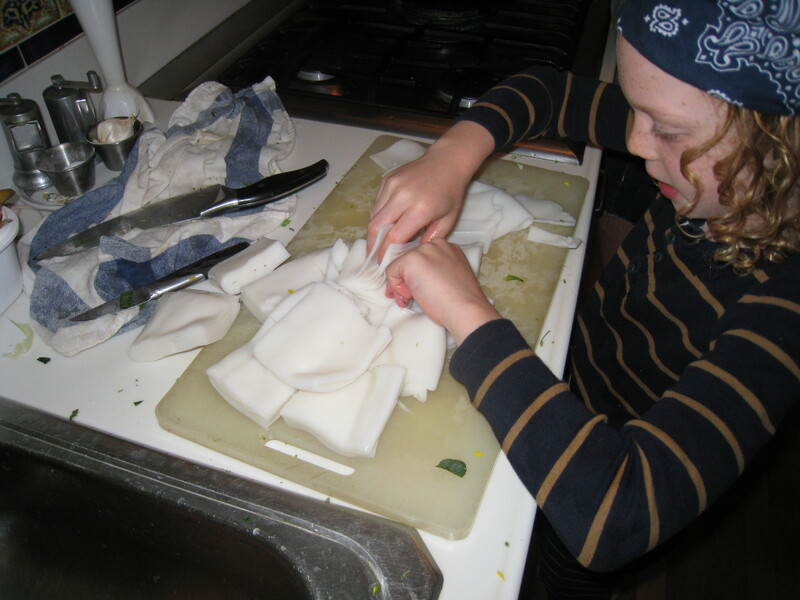 I then add the things that take the longest to cook – broccoli, carrots, red peppers, bok choy and then some freshly frozen corn that we had taken off the cob a few weeks before. I also a dice extra firm tofu or sometime I use frozen edamame. 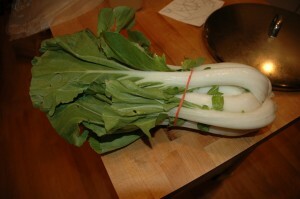 You can put in almost anything and I use spinach, or other cabbages or whatever we got or can find. 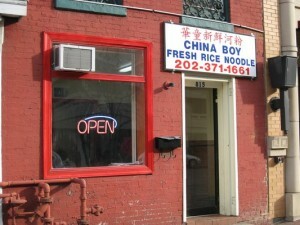 Over a few noodles, we spoon the soup, add spice to taste, and we are good to go. The whole process takes about 20 minutes max and there is always plenty of leftovers. I have been know to start the day off with a bowl or two for breakfast when it is a cold morning and you just can’t get warm. I have just been informed they want to be squirrels next year. I think I will get a jump on that soon…..